As much as I love making desserts for the holidays, especially Halloween, I find that there are occasions where I need something quick and easy but equally as impressive as something like the candy corn cake. For instance, on Halloween night my family always stops over for a small get together after the kids are done trick-or-treating. When I walk in the door, I’m tired, my feet hurt and the last thing I want to do is start serving guests. That my friends, is just one of the few reasons I fell in love with the idea of making the Kooky Candy Coated Marshmallows when I saw them in the Wilton Idea Center online. 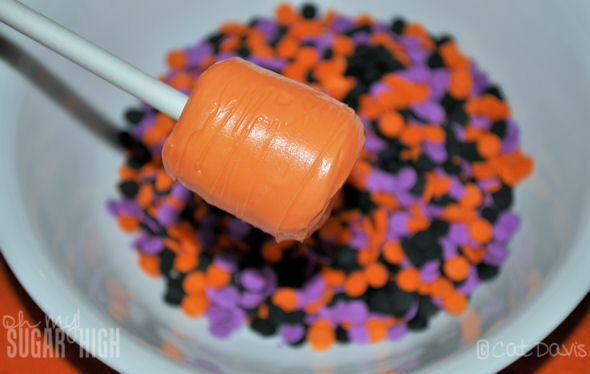 They’re simple, affordable and have just as much Halloween spirit as most other desserts. Plus, you get to eat them on a stick. Who doesn’t love stick food? 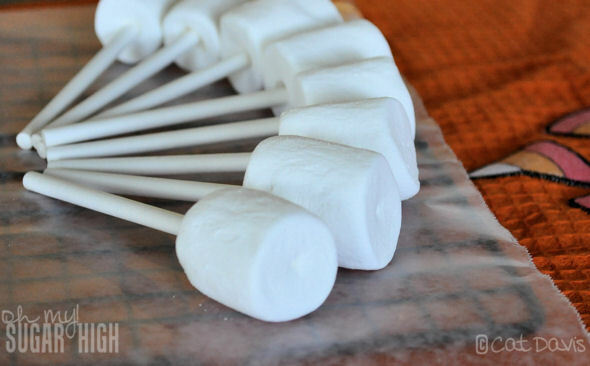 Simply start by placing a lollipop stick through the center of each large marshmallow. 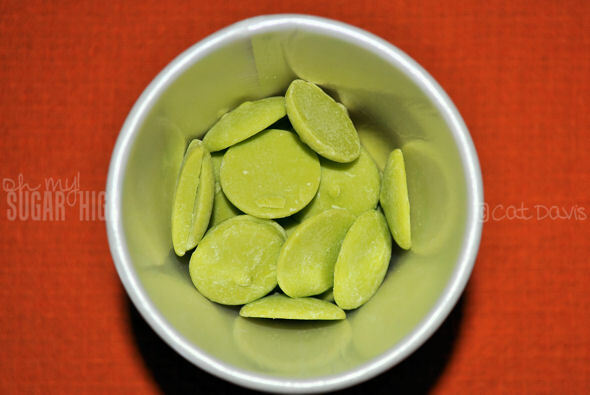 Now, if you want these to be a more interactive treat for say a kid’s party, you could set these aside in an air tight bag and let the kids dip their own. In a microwave safe cup, melt any color of Wilton Candy Melts for 30 seconds at a time on a medium heat, stirring between each reheat. I found that 50% power for a total of 3 minutes 30 seconds worked out perfectly for about 1 cup of candy melts. Next, sprinkle on your favorite decorations and stand them on parchment or wax paper to dry. You can even pop them straight into the fridge to chill before serving. On the outside a smooth candy coating, on the inside, a fluffy sweet marshmallow. Disclosure – As a Wilton Mom Ambassador I was provided with some of the products used in the post, some were purchased myself. Opinions expressed are my own and are not influenced by monetary compensation. What a great idea. My son doesn’t really like marshmallows but this would be something fun he and I could do together, although he might like marshmallows covered in all this other good stuff! CUte idea! I think this may replace our Halloween cupcakes this year! I did these for a couple of baby showers. They really work great for any theme, they’re super simple and a big hit. I bagged them and then tied them off with ribbon and curled the ribbon., so that guests could take some home. Those look so cute, easy, and delicious! 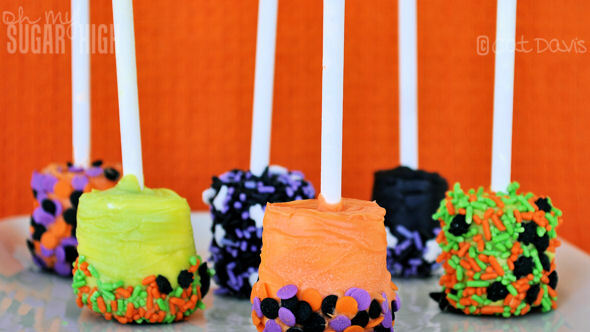 My two preschoolers would love making those with me for their class Halloween party. Those are freakin’ awesome! Similar to mine I did a week or so ago, but yours are better! Good job Cat! Cat, these are toooo cute!! I love it!! Those are adorable Cat, great job! I am totally going to make these for Halloween! I made some (a variation of them anyway) and blogged about it with a link to you! Yummy! I totally want to make these. These sound easy and fun! The kids will love me too! These are the most adorable and sound super simple to make!! 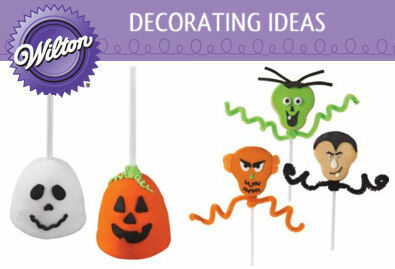 I love these marshmallow ideas! I make candy covered marshmallows for every holiday! 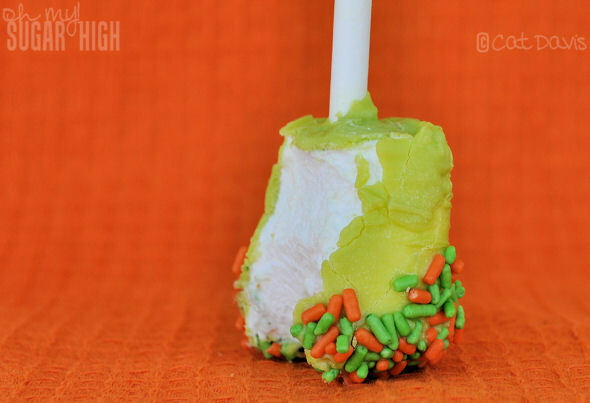 I’ve done chocolate covered marshmallows several times, but I’ve never made then in pops by putting them on a stick! Genius! Just added this to my favorites. Not only do they turn out really nice, they seem like something I could pull off and even have the kids help. I did not know they now have Midnight Black and Spooky Green melts. I will have to get some. 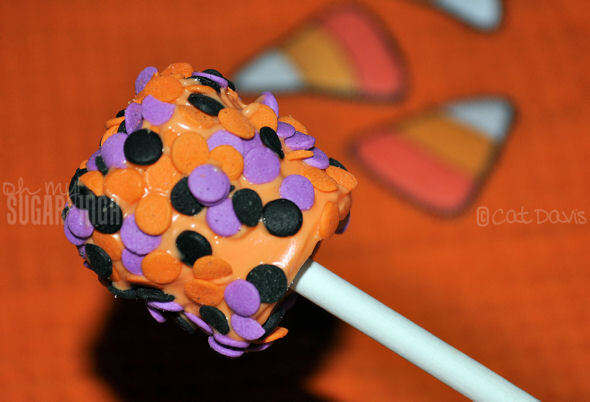 I was able to find the new Halloween colors of the Wilton baking melts and now on my 3rd batch of Marshmallow pops. They are turning out great! Kids love them and are having a blast helping. Thanks for the great idea! I am thinking this treat might be worth repeating around Christmas time. This is such a great recipe to make with kids. I’m sure it would get a little messy but I know my daughter would love making these. 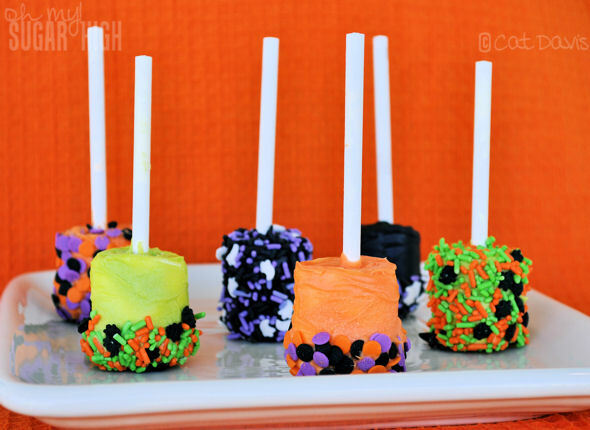 Wow these seem like the perfect treat for my son’s class, so cute and easy! This is such a cute idea though! I may have a Halloween party so I’m thinking this will have to be one of the treats..or maybe an altered version with bananas 🙂 Thanks for sharing!